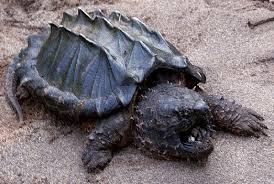 This chelonian's claim to fame is their hunting technique. 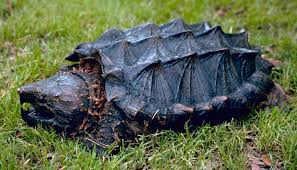 Alligator snapping turtles will lay on the bottom of their aquatic environment camouflaged with the muddy bottom with their mouths wide open. 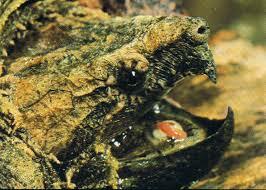 Inside their mouth is a small pink vermiform (worm shaped) tongue that acts as a fish lure using Peckhamian mimicry. 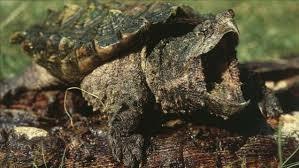 Once the unsuspecting prey enters the jaws to nibble on “the worm”, the jaws are closed and the prey item swallowed. This is not the only way these animals hunt, some individuals, especially juveniles, will hunt for their meals and ambush.